There is underground parking in our building, or meter parking available on the street. The Skyline Club Board of Governors have given approval to open the Skyline Club to the public for dinner for a limited time. 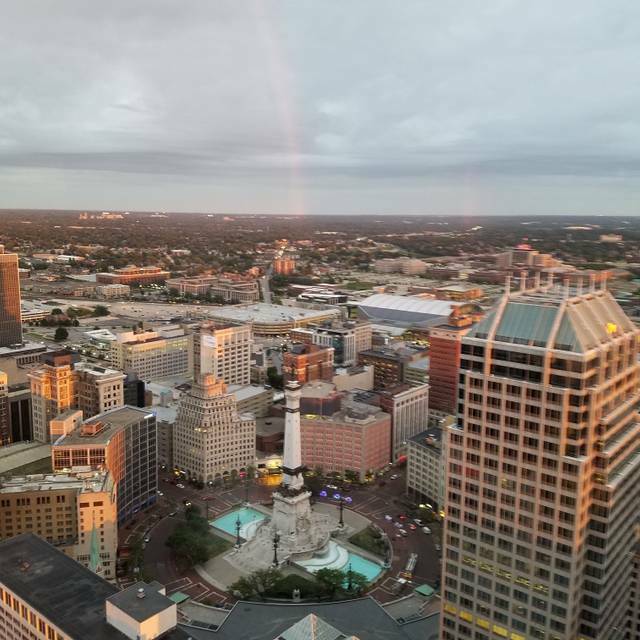 The Skyline Club, a private business club that sits at the top of the One America building has panoramic views of the city's skyline, Lucas Oil Stadium and Monument Circle. Elegance without being stuffy. Bring a group or enjoy a romantic table for two,the view is always amazing at the top! Fantastic Easter brunch. Delicious food stations. Excellent variety. Great music and spectacular views! The service was slow, the food so-so, and the bill was equal to a 5-star eatery. We had a recommendation from a friend and decided to give it a try. We have no plans to return. We were, however, seated promptly, and our reservation through OpenTable went off without a hitch. 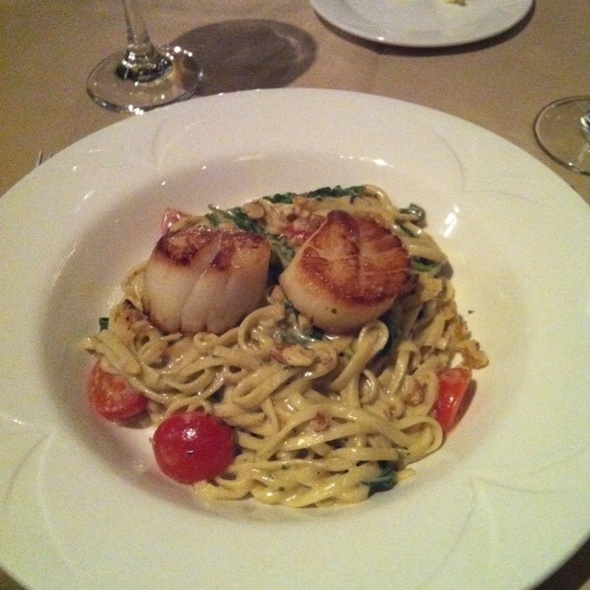 Food was amazing and the service was great! Thinking about possibly getting a membership now! The food was great! The service was fantastic and the view was AWESOME! View was cool, place was dead, and they charge you a random 16.5% service charge on top of taxes. Drinks and shots were extremely expensive and not priced correctly in comparison with other drink items. Shot of grey goose is $14.... Of course the server expects a tip as well. Great food,great service,a bit slow on getting food out.Drinks a touch pricey which seems to be the norm now. Brought a friend in for dinner and as always, had a wonderful time! Great location, food and service. I made a reservation to celebrate Valentine’s Day with my wife. When we arrived everyone was very polite. Our surprise was when we received the menu and we noticed it was completely different from the one listed here. They had made a Valentine’s Day menu in which we had the option to pick one of 3 starters, one of 4 meals, and one of 5 desserts. None of the items in this menu are listed on the menu available here. The options were not even close to good. Overall this place made our date very unpleasant as we ended up leaving and making a reservation at The Oceanaire instead. They might have put their menu of their website but if they give people the option to make a reservation through here, they should also update their menu on here. If I use this app to make the reservation I will not visit the place’s website. I specifically picked this place with the intention of seeing what they offer and maybe purchase a membership. So 1st experience was kind of disappointing. Went for Valentine’s and had a reduced menu options. Service was poor, and I ended up ordering the chicken with an add-on. Chicken 3 course dinner was $80 which i thought was overpriced, but not only that, because i asked for the add-on, they gave me a smaller piece of chicken than what i saw in other tables for same price. 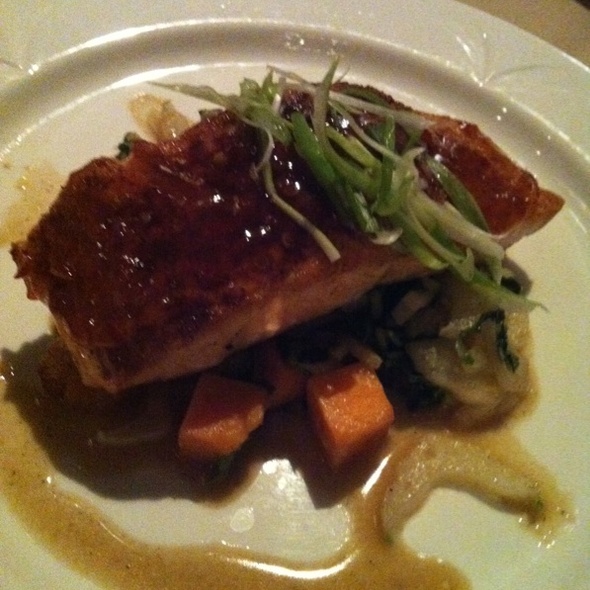 Even though i would like to try the full menu and loved the ambiance, is hard for me to go back or recommend it. Bar selection was not very good and was not at the upper end of quality. Food selection offered was limited and not very imaginative. 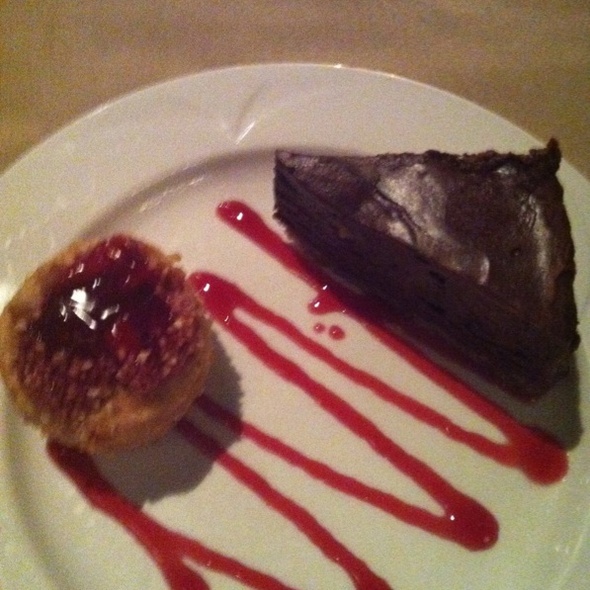 Deserts were too overpowering-no subtle blending of flavors - presentations were fine. Coffee was old and way below McDonalds quality. Overpriced, bad food, and horrible service plus if you are not a member you do not to sit anywhere near a window so you don't get a view. Would not recommend to anyone. Service was great. Food was mediocre at best. Especially for $200. I would gladly recommend to a friend, however I would let them be aware of the "service" charge that will come with the bill. I understand this is a high end establishment, it just seemed a bit ridiculous and unexplained. The restaurant and location is gorgeous and has a fantastic view of downtown. The food was stellar and service superb. The issue is that there is a $20 service charge give to the bill that is not warned or talked about until after your meal is finished. The charge is not the tip. It was not unaffordable for the price of the meal itself, just $20 more than one is expecting to pay for no reason. Poor overall service, not what was expected, was considering being a member. Now not interested. Unorganized and seemingly unprepared for our reservation. As part of Devour Indy we went to the Skyline Club. Brought friends with us and we were hit with a service charge that we were not told about. This was not stated on line or in the menu. We were not in the main dining room as there was a wedding going on. Waitress never introduced herself and was seldom seen. Devour Indy menu offer Carrot Cake as an option but then were told after dinner we were only offered cheesecake even though we had ordered the Carrot Cake. Beautiful view, service was a tad below average though. The table was not set completely when we were seated. Silverware pieces were missing randomly. They did not cook the bread properly and therefore no one in the restaurant at that time (1.5hrs) received table bread. The waiter just about spilled a full glass of wine all over my guest and the table. Food took a while to come out. The view is worth it, but not sure if we will return. Took my wife during Devour Downtown and it was absolutely phenomenal. Good, atmosphere, and service were all on absolute point. Thank you all for the wonderful experience! Always enjoy the buffet that is out during Devour. Lots of great fresh vegetables, cheese, salad. Also a few different hot food choices and many deserts. Was SURPRISED about the $15 add on charge for a service fee. Food was very good as was service, but 'SERVICE FEE" ? It is always a pleasure seeing the skyline club participate in the devour and I am back for every occasion I can. The sights and the food are worth it every time! We took our son and daughter-in-law to the Skyline Club for his birthday. It was their first time, though we had been there before. They loved the food and the view. The buffet is always very good. The service was excellent. It was a veey enjoyable experience. Very nice view of the city. Food was excellent service was great. I enjoy led my self and would definitely be back. Wasn’t told when making reservation that it was buffet. Might have been the WORST dining experience I have ever had at a restaurant. Everything from the extremely awkward silence to the terrible food was bad. I cannot believe that people pay to be members there! Not to mention, I went there for dinner with a view; of the 4 groups of people in the side room, we were the only ones without a view. I will never be back nor will I ever recommend it to anyone. Nice setting and quality food but service was slow given the number of diners. It was a little disconcerting to think you were going to have a beautiful view of Monument Circle when you reach the restaurant only to find out that there were "special parties" on that side of the building. We were seated at an industrial view of hospitals and factories. We were seated. A table of four seated after us were served before we were. We weren't in any hurry but that's just not good policy. Asking for water, we didn't get it for probably 10 or 15 minutes . We finally asked one of the waiter's at another table if we might have some water. When we received our entree , it was lukewarm. After taking it back, the waiter told us they made a new entree for us as they had no microwave. However, the bite that my daughter had tasted was still out of that piece of meat! Probably will not return to that club.